The National Hurricane Center this morning forecasted a 70% chance that Invest 97, now just south of the Bahamas, would form into a tropical cyclone. Destination? The central Gulf. In his McBriefing yesterday, Kent Wells announced that instead of running and cementing the last liner into relief well 1, they had already run in a storm packer to temporarily seal the well and were preparing to shut down. 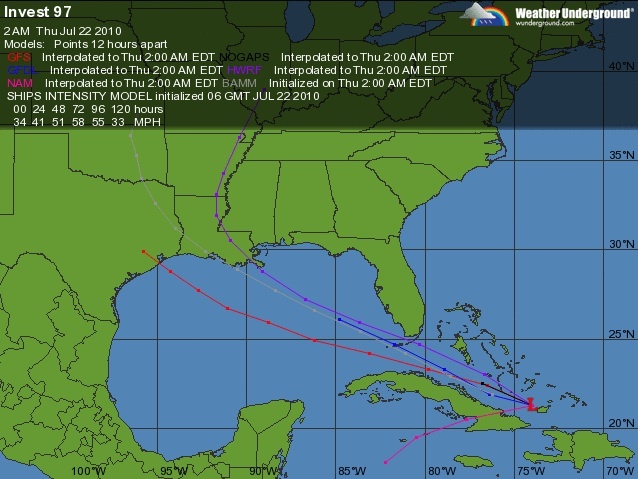 Here’s the storm track by computer model. I agree with what Cavnar as written previously: instead of doing the “well integrity test”, BP might have been able to kill the well by now if it hadn’t suspended drilling of the relief wells so that it could run that test. “A hurricane on Katrina’s path would push a lot of stuff onto shore, given where a lot of the oil is right now,” says Luettich. What happens when the hurricane moves inland? It’s not just coastal residents affected by the massive storms. The remnants can affect communities hundreds of miles inland. As the hurricane moves inland it will pick up particles of oil. That will become part of the sea spray that moves inland with the storm. According to Chris Zappa, an oceanographer at Columbia University, we’re likely to see a light coating of oil on electrical wires and trees. He likens it to standing in sea spray for a while. You’ll walk away with a light sheen of salt water on your skin. Instead of salt water, it will feel like oil water. However, this would be a very localized effect. For example if a hurricane made landfall in Alabama, the coastal communities would feel the oily sea spray. However, it wouldn’t make it to Montgomery or even Dothan, which are both more than hour inland. Thinking about a sheen of oil on your skin may give you the heebie jeebies, but it won’t hurt you. Experts at NOAA (National Oceanic and Atmospheric Administration) say the amount of oil that would be carried inland in water vapor would be less than normal levels of pollution. I don’t believe anyone has studied the potential effect of a hurricane on the large amounts of methane released by the oil gusher, and the millions of gallons of Corexit sprayed into the Gulf. While some blithely dismiss any danger and others are giving apocalyptic visions, I don’t think anyone really knows how bad it could be. Based on unique measurements taken directly under a powerful hurricane, the new study’s calculations are the first to show that hurricanes propel underwater currents with enough oomph to dig up the seabed, potentially creating underwater mudslides and damaging pipes or other equipment resting on the bottom.